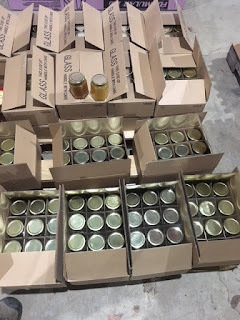 Made up 30 cases of creamed honey, cinnamon and clover honey. I give the creamed honey to my friends and relatives. This is about 200 lbs of honey. It will take about 10 days to set. So it should be ready to give away by Dec. 10th. Starting Dec 1st we will be changing to our winter hours. We will be open Saturdays only, 10 - 2pm. Any other time is by appointment. We do not have a problem setting up a time that better fits your schedule, if Saturday doesn't work. Beekeepers right now are finishing covering their hives for winter. 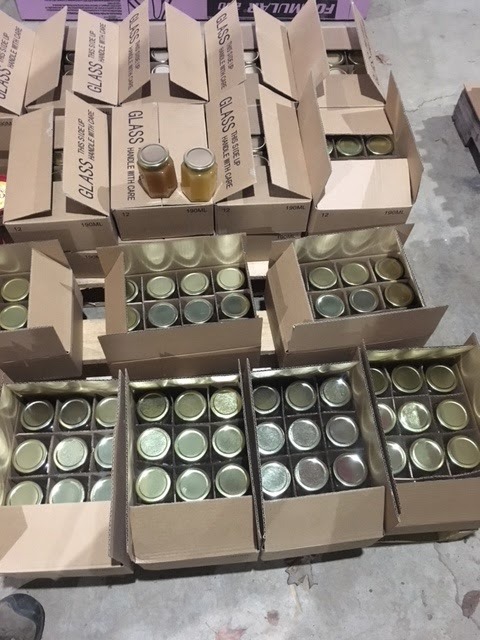 The unexpected warm weather is still giving beekeepers a little extra time to treat with oxalic acid. Plus the warm weather is making the bees consume less honey. This may help beekeepers who have light colonies going into winter. Did you know that Nature's Nectar LLC sells 5 gallon pails of bulk honey. If you need some honey for holiday gifts, give us a call to reserve a pail. Also we sell bulk strained beeswax. We have a special beekeeper price of $7.50 lb. We do have an assortment of candle molds and wick. This is my making creamed honey video. I post it every year just before Thanksgiving. Creamed honey is liquid honey that is processed by mixing warm liquid honey with a starter seed of creamed honey purchased from a grocery store. After the honey and seed are combined and bottled, it takes about two weeks to firm up. (The creamed honey needs to be bottled in a wide mouth jar, so the contents can be removed with a butter knife). So give yourself time for it to get ready before gifting it. The creamed honey spreads like butter, but it is all honey. What happens is, the seed which is finely ground crystallized honey. Will start to replicate the fine crystals. Over the two week period, all the honey will crystallize by replicating the fine crystals. This leads to a nice smooth texture. Normally when honey crystallizes the texture is very course. But by mixing in the fine crystals of the seed, the process controls the replication to the fine crystals. Creamed honey is easy to do. It makes great holiday gifts. Your family and friends will be amazed at this wonderful treat. The honey used has to be liquid with no granulation crystals in it. Sometimes the honey needs to be warmed up before making creamed honey to make sure it is clear of crystals. If making a small batch, say 10 lbs or so. Honey can be put into a gallon pail and put in a water bath in a crock pot. Heating on low brings the temperature to around 125 degrees. This usually will clear up the crystals. Make sure it is clear by gently stirring a time or two to make sure no crystals are on the bottom of the pail. Remove it from the heat when it appears ready. Wait for it to cool down to about 95 degrees before adding the seed. Too hot and the seed may melt, it is granulated honey after all. Too cool and the seed will not be properly mixed into the honey. After the seed is mixed in and the honey is milky in color throughout the mixture. Set it outside for a quick cool down to keep the crystals from melting. The weather is warming up. The upcoming week looks good for any Oxalic Acid treatment. Oxalic acid is applied when it is 40 degrees. I have been harping a lot about the Oxalic Acid treatment. I firmly believe that this treatment can improve the odds of successfully overwintering your hives. Here is a re-post of the dribble method YouTube video. This has been a cold week for beekeepers. Many beekeepers wanted to do Oxalic Acid treatments but it has been a little to cold to do it. The next couple days will be also too cold. It looks like next week some heat returns with highs in the 40's again. Several days look good for applying the Oxalic Acid. The dribble method should be done at 40 degrees. Covering hives with winter covers is progressing. Many beekeepers are putting on winter patties or a candy board on when putting "the hives to bed". New beekeepers who are running hives next year and their hives are in bear country, still have time to put tee posts in the ground for a bear fence. Best to put the posts and ground rods in now, before the ground freezes. The rest of the fence can be installed at your leisure. Sometimes the ground is still frozen in early April. This can leave a hive unprotected at a time when bears are waking up from hibernation with an empty stomach. Cold weather is coming soon, another few days next week to finish mite treatments and then the bottom can fall out of the thermometer anytime after that. With deer hunting coming this weekend. I wanted to give the hunters something to shoot for. Most of these pics were near one of my beeyards. I don't hunt, but I like looking at wild things with a trail camera. A doe pic was one minute before when this pic was taken. The big bucks normally only travel at night. The rut brings out a more careless behavior. Looking for love. Looks like a 10 point buck. Trophy size.